The physical assets of a university require capital to create, operating funds to maintain, capital to replace worn out of obsolete components, and capital funds to dispose of the asset. These concepts are embodied in the total cost of ownership model. This chapter will cover the aspects of recapitalization management using life cycle cost and total cost of ownership principles. Recapitalization is defined in funding terms as periodic recurring costs for replacement/renewal projects and one-time funding for improvements and programmatic projects. These are capital costs associated with the reinvestment of funds in a building or fixed asset. These projects are typically larger in size than annual maintenance work is, and they often involve replacing or renewing a building’s major subsystems or infrastructure areas. Addition: Installation of a new building security system or electronic keying system. Reconfiguring internal space to accommodate new requirements. Replacement tasks: This effort involves scheduled replacement of old or obsolete equipment and materials. For example, a building's fire alarm system has a life cycle of 10 years and the building may have a design life of 50 years. Over the design life of the building, the fire alarm system is predicted to be replaced four times. When a replacement fire alarm system is installed, it must incorporate the technology that is available at the time of the installation, which may not be the same technology that was available when the former system was installed. Replacement tasks also include the replacement of obsolete equipment or systems. Renewal tasks: This effort includes periodic but substantial work on a component in an attempt to restore operating characteristics that make the component run like new—for instance, retubing a chiller halfway through its useful life to improve its performance. Retrofitting tasks: This work is similar to renewal efforts and has the primary effect of adding economic life or value to the asset. An example is a modifying a boiler from coal operation to natural gas operation. The consistent use of appropriate terminology provides a foundation for the establishment of robust, scalable, and repeatable processes; best practices; and methodologies, standards, metrics, and benchmarks for facilities and physical infrastructure management. Common terminology also enables effective communication among the various decision makers, building managers, operators, and technicians involved with facilities and physical infrastructure investment and management. To help foster effective communication among public and private sector organizations with interests in facilities, infrastructure, and real property, a chartered interassociation working group was formed. In June 2002, a Definitions Committee was established, composed of representatives of the National Association of State Facilities Administrators, the Association of Higher Education Facilities Officers/APPA, the Federal Facilities Council, the International Facility Management Association, Holder Construction Company, and Infrastructure Strategies. Its task was to put forward a framework and a glossary of terms commonly used to communicate about facilities-related issues, from space planning and construction through operations and upgrades to demolition and replacement. This document is the culmination of the Definitions Committee’s work. The framework, glossary of terms, and associated metrics contained within will be put forward for adoption or approval by the respective governing bodies of the participating organizations. It will also be made available to other organizations and interested parties. 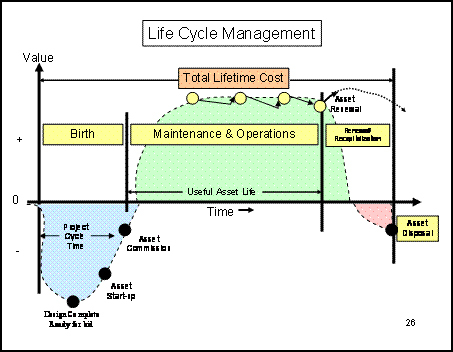 The Asset Life Cycle Model for Total Cost of Ownership Management (Figure 2) defines the cradle-to-grave responsibility for measuring and managing a physical asset’s useful life. The framework provides a structure to help property owners, managers, overseers, and others determine and manage the total cost of ownership to best support their particular organization’s overall business or mission. In this instance, the model is a framework for organizing the glossary of commonly used terms and definitions. The Asset Life Cycle Model comes from the activities that occur over the lifetime of a physical asset—programming, design, construction, operations, maintenance, repairs, and utilization—and the core skills or competencies required to perform these activities. The competencies are further aligned with the business areas supporting specialized asset management business processes and practices, referred to as industries. This organization gives focus to the resources and skills required to effectively manage an asset in any particular phase of its life cycle. An asset's useful life will be affected by how well the industry or competency is being performed. Connected with this research is a glossary. The glossary of terms and definitions is organized by industry—space management, project delivery management, operations management, and capital asset management—and competencies. It also identifies metrics and/or cost models that can be used to measure the level of performance of each industry and competency. The definitions for each of the identified terms are derived from earlier work of the participating organizations and modified by the Definitions Committee. The overall value of this research comes in a summary of what experts consider to be important measures and metrics for each competency and for each industry included in the wheel. Figure 3 is a partial sample of the research. This research sets the stage for the next step to determine best practices in the field of life cycle management. 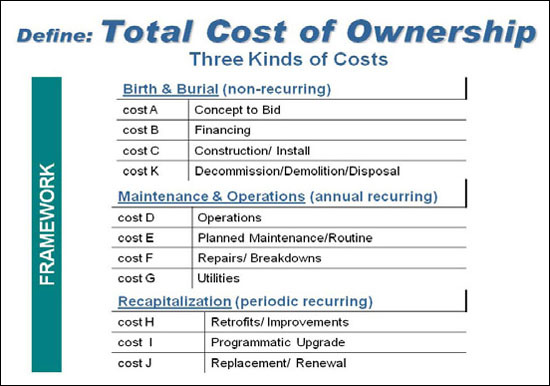 Figure 4 is a summary of life cycle management broken out by the total cost of ownership main categories. Every asset goes through a cycle: birth, operation and maintenance, and the decision to renew, replace, or extend its life. Life cycle principles will guide facility managers in making correct decisions. One of the important outcomes from life cycle management is that it allows management to know the expected life of an asset. This knowledge allows management and owners to plan its replacement. The goal of life cycle replacements is to maximize the useful life of the investment and have resources available at the time of replacement. There are many ways to assess the status of an asset, system, or component. 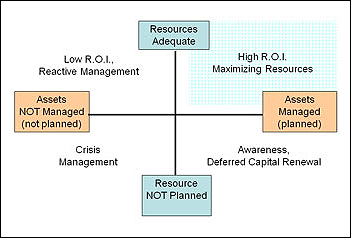 Figure 5 explains how the industry views condition and replacement. 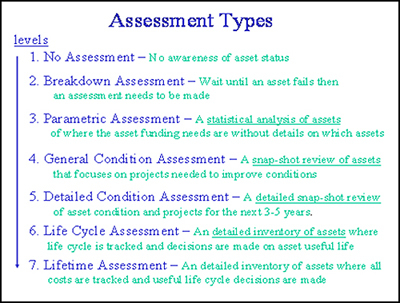 Depending on the asset, the following assessments can be made. Each level focuses on how well the assets need to be managed. Levels 1 and 2: Wait for assets to run their course. No funding is usually tied to the assets, so funding becomes an emergency. Level 3: An analytical approach on how much funding is needed, though the approach does not isolate where to spend the funds. Levels 4 and 5: Condition surveys. This approach usually requires an outside firm that is hired to look at what needs to be done. The report estimates the work, usually by building, and gives a set of projects that need to be done. Projects are prioritized by importance. The institution justifies the funds and then goes to work getting the needs met. The bad side of this approach is that in three to five years there needs to be another survey of needs and another set of projects. The concern with this model is that it is expensive and not all the projects are done since new priorities show up. Money is wasted. Levels 6 and 7: An initial inventory of the assets that you chose to manage. There is a one-time cost to establish the inventory, which will be managed along with the assets. The inventory also eliminates the need for ongoing condition assessments. For Level 6, managers will collect the data needed to replace the assets and predict the future costs of managing the life cycle of the asset. For Level 7, managers will collect all the service requests, preventive maintenance orders, and other cost information about an asset. The largest amount of savings occurs at this level, because the inventory will show the lifetime costs of owning that asset and suggest when and how to maximize its return on investment. Life cycle management principles allow for management to make integrated decisions about assets. The goal of any investor is to make sure that the investment is maximized in the life cycle. Sometimes an asset is minimized because the usefulness of the asset was gone before the end of the life cycle. For instance, computers usually are not replaced because they are worn out, but because their useful life has ended. We make many of these kinds of decisions all of the time. There are some assets that cost so much that we expect years of return on our investment. Total cost of ownership asset management, where all costs are being tracked, requires work but will save money. Collecting all of the asset costs in real life allows managers to monitor the cost to maintain an asset. If the monthly or annual maintenance costs start to exceed the value of the asset, you could choose to replace it to save future costs. These methods are used to maximize limited capital dollars and return the best value to the investment. Managers have a tendency to over-maintain an asset. Some think that a longer life cycle is the best option. If a manager knows the total cost of owning an asset, it is good management practice to save the maintenance and further capital investment by replacing the item. This approach should become a best practice. The decision to replace an asset, component, or system usually boils down to justification: resources, useful life spent, and real needs. Facility professionals are always making these kinds of decisions. Sometimes there is pressure to replace something that has not maximized its investment, in order to adopt the latest and greatest piece of technology or the latest tools. Life cycle management, however, provides management with data and information to make better decisions. Because the asset is monitored from the beginning of its life cycle, the total cost of ownership decisions are available during the life of the asset. Example: An asset costs $10,000 and has a 10-year life cycle. The investment per year is $1,000. If the maintenance cost over the 10 years is more than $1,000 a year (unless there are known reasons for extra expenses), this asset is not worth keeping. If at the end of five years the cost to maintain this asset is greater than $5,000, management would have enough data to make a decision about whether to replace it. Management's role is to keep resource providers aware of needs. Defining the current capital needs and long-term needs is the responsibility of any facility professional. Life cycle management is a tool to help assess assets and their needs. Any asset that exceeds the cost to maintain it shows up for review, and allows managers to evaluate its usefulness. When do I need to replace the system or asset? Am I spending too much on maintenance for this asset? What funds do I need in the future? Should I recommend the same asset when I replace it? Is there a better asset that will reduce operating costs? All of these and other questions can be answered when life cycle management is working. Figure 6 shows the information from a database inventory. The left side of the chart shows the history of funding in green, with a black line that represents the needs for that given year. After reviews and inspection, the gap represents those items deferred. The right side of the chart shows the assets that will be coming up for review. Each column contains all of the assets over the next 40 years, with their cash flow needs. This means that assets with 10-year life cycles will show their remaining life, the next replacement, and the 10-year repetition. This graphic is used to show future needs and funding levels. The goal is to provide the level of funding needed to manage the recapitalization of the investment made. This is defined as the remaining life in the asset at the point when the usefulness of the asset does not meet the mission or future vision of the owner. As in the computer example above, the investment may be obsolete before the end of its life cycle. When the life cycle drives the replacement, meaning that risk of failure is close, then the replacement happens because an asset is worn out and no life cycle remains. This does not mean that the color has changed, or that it needs repairs or a retrofit; this means that a similar replacement is needed to maintain the function of the investment. Deferred renewal comes into play when managers risk keeping an asset beyond its life cycle. This usually results in emergency funding, and the cost of not planning results in more expense than needed. Maximizing the life cycle is the job of facility managers. At some point in an asset's life, it becomes too expensive to maintain. A rule of thumb to determine when the asset's maintenance is costing too much is to take the value of the asset ($10,000) and the life cycle (10 years) and come up with the annual replacement amount needed for the life of the asset ($1,000). This figure could be adjusted for inflation. By tracking all of the costs each year that are spent on the asset (service requests, preventive maintenance, repairs, etc. ), you will get an idea of the cost to maintain it. By accumulating those expenses over the years against the amount it takes to replace the item by month, you will soon find out if the expense crosses the replacement amount. Very few assets cost more to maintain than they are worth. The owner needs to determine how much to spend on maintenance before replacement. Life cycle management allows facility managers to know the real return on investment of a given asset. Measuring the actual life of an asset and knowing all of the costs that it takes to manage that asset are important information and knowledge. Knowing what kinds of assets to recommend for a new building based on experience and real numbers gives the owner and the facility manager the best long-term investment it can make. Keeping a history of each asset allows the organization to cut costs, not only in operations and maintenance but also in capital funding. The asset libraries are always adjusted by new and improved assets, but the cost of the function of the new assets can always be measured against the history. For example, if you had a history of roofs and what a roof costs to buy, install, operate, and maintain, and you know its actual life based on experience rather than a manufacturer's recommendation, the whole process of maintenance and funding will benefit from that knowledge and understanding. Building a history of critical assets can ensure sustainability for a number of years. 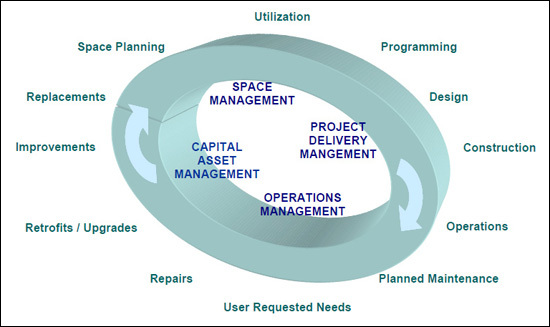 Building Information Management (BIM) supports the concept of life cycle management. BIM can speed up improvement, retrofit, and replacement projects, and allows every new project to be better than the last. BIM also fits into the total cost of ownership model concept by ensuring that the owner is measuring resources properly and managing investment decisions correctly. 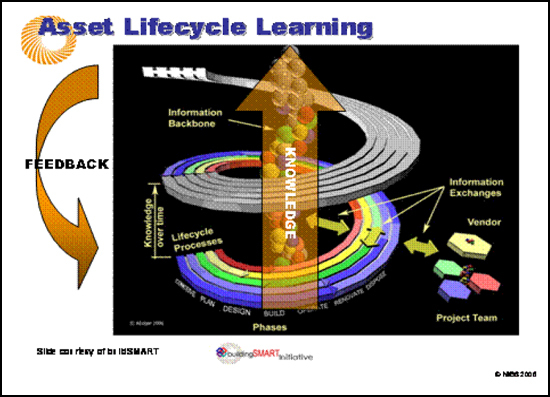 With the BIM focus on the best ROI, the following Asset Life Cycle Learning graphic reflects the advantages of a having a single database manage the life cycle of an asset. A closed loop of data and information centered on the asset allows for better decision making. ROI information drives what the next replacement will be. BIM promotes improvements, better access for all users, and integrated decision making. BIM is the future of facilities management. Permission: Used with permission from Dana "Deke" Smith, President of BuildSMART. 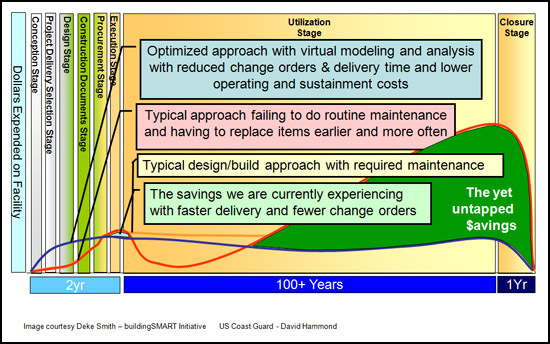 The following graphic shows the full life cycle saving that can come from a BIM concept. Since you begin any asset with all of the data and information needed, any additional information adds to the value of the process. Tracking the total cost of ownership to add to the BIM information allows facility managers to be prepared to manage and even extend the life of assets. The savings that BIM provides in the design process will change the way the operations and maintenance data are captured and used, as well as the way recapitalization can begin to track all the costs related to the systems created in the design process. The recapitalization part of total cost of ownership is the management of data and information about the asset. What that means is that the Birth and Burial costs, which are non-recurring costs, are kept in the asset database as the initial cost of the asset. If you are tracking a system, then that is the asset. If you want to track a building as an asset, you will want to break the building into systems and then total the systems to get a building total. The operations and maintenance costs are also tracked against the asset. If there is not an asset database, then some systems track operations and maintenance costs of the asset in the work management system. This information could then be made available at recapitalization time. To be effective, total cost of ownership needs to be managed in a capital inventory where the cost, life cycle, and recapitalization data are stored. All asset replacements fall into this cost category. Facilities portfolio managers and institutional decision makers require a comprehensive asset investment strategy: a set of integrated decisions that take into account the needs and priorities for construction and renovation, the total costs of ownership, and alternative investment choices that impact the institution’s basic mission and objectives. However, integrated decision making is not the norm in most institutional and governmental environments. More typically, basic funding for operations and capital budgets is distinct and usually separate, as are decisions regarding organizational responsibility and staffing. In colleges and universities, many facilities are custom-designed or built to suit specialized uses, which are determined by current users or stakeholders who may or may not have a perspective on long-term future needs—a circumstance that tends to minimize rather than optimize long-term flexibility in the use and function of spaces. The decisions to determine needs, priorities, and the extent of the investment required for facilities and major equipment are not unique to college and university campuses. The same decision-making criteria are applicable to all organizations responsible for significant facilities portfolios, including federal and state agencies, school districts, and many corporations. What elements are critical for a clear and effective asset investment strategy for facilities management? A sound strategy takes into account critical factors or decision tools that will help institutional executives and facilities professionals work together to establish and maintain an organizational, financial, and cultural environment in which integrated decision making about facilities is the norm and an environment of stewardship is the goal. To start, all decision makers should consider some basic strategic questions before initiating any investment in an institution’s facilities. The book Buildings: The Gifts That Keep on Taking provides 50 basic policy questions that are most commonly asked by those involved in the decision-making process related to entire capital programs and specific capital projects. Where and when should we invest? An integrated process takes into consideration the operational costs, programmatic costs, long- and short-term influences, and impacts of each prospective investment. How does this definition apply to recapitalization? Recapitalization is the learning organization for facility managers. If recapitalization management is working and assets are being tracked for cost and life cycle information, some learning is taking place. What are some of the things that can be learned? Ways to reduce the overall cost of managing investments. The goal of a learning organization is to help management make the right decision for the future and for everyday activities. Learning organizations plan for needed resources and for which assets are going to need resources. The chart below shows where the learning organization should be functioning: high return on investment and maximizing the limited resources given to maintain our stewardships. There is more to learn as we continue to progress on how to better manage the existing built environments. As the role of total cost of ownership is better understood and applied, the growth of BIM and the movement toward life cycle management will give the profession new direction. Recapitalization management using life cycle and total cost of ownership principles is a platform for change. Emerging Information Technologies for Facilities Owners: Research and Practical Applications. Symposium proceedings, Federal Facilities Council Technical Report no. 144. Washington, DC: National Academy Press. National Institute of Building Sciences, 1090 Vermont Avenue, NW, Suite 700 Washington, DC 20005-4905. (202) 289-7800, (202) 289-1092 Fax. www.buildingsmartalliance.org. Asset Lifecycle Model for Total Cost of Ownership Management. Framework, Glossary & Definitions. 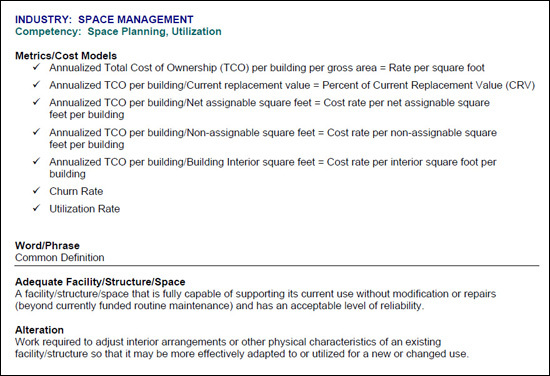 A Framework for Facilities Lifecycle Cost Management. “Buildings...The Gifts that Keep on Taking.” APPA, Alexandria, VA, 2007. “A Common Vocabulary for Asset Investment Strategy,” March/April 2007, Facilities Manager.